Hi everyone! We are going into the second week of not having a working fridge. After getting rid of whatever was causing that embarrassing stench (I shared this piece of info with my friend while our girls were having a swim playdate, she laughed so hard and called me pathetic, it was pretty awesome), hubby went on YouTube to see whether he can resolve the problem himself, it’s amazing to see the man at work, he opened everything up and figured out the fan is no longer turning, so now we are contemplating whether he should just replace the fan himself, or we should wait for the warranty repairmen to do that for us on August 9th, which is 9 whole days away… Ugh!!! The lack of a working fridge means I can’t have fresh produce around, so far I’ve been using frozen goods, and tonight I just bought a rotisserie chicken from the market and wrapped ourselves some chicken tacos for dinner. Not cooking is giving me the itch to do something in the kitchen (do y’all feel the same itch also? ), that’s why the decision was made to bake some healthy snacks, so little girl and I can make ourselves useful while watching the 2008 Olympic opening ceremony… Hahah you read that right, the London Olympic opening ceremony reminded us how in awe we felt 4 years ago when Beijing was hosting the game, so it was time to review the glory all over again while we are having Olympic fever! 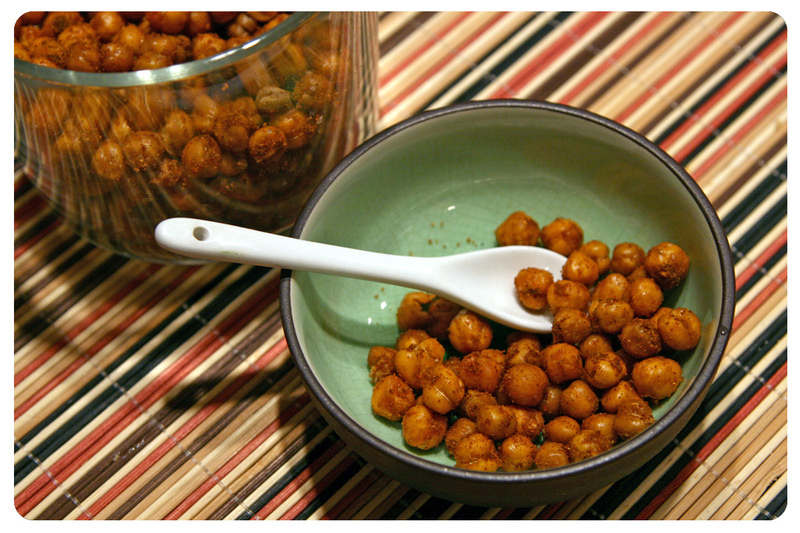 The finished chickpeas are crunchy and delicious, the aroma fill the whole house and made us want to eat more, thank goodness this is such a high fiber and protein snack, I don’t feel guilty eating them. Hope you will give it a try too! Drain the chickpeas, rinse thoroughly and dry them using paper towels. Pick out and toss the darker colored peas. On a baking sheet, cover with foil, lay the chickpeas flat and spread evenly onto the foil. Once the oven is hot, bake the chickpeas for 20 minutes, shake the baking sheet every 10 minutes to ensure even heat distribution. Put the rest of the ingredients in a large bowl, when 20 minutes is up, dump the hot chickpeas into the bowl and mix thoroughly. then bake the chickpeas for another 20 minutes, make sure to shake the baking sheet at 10 minutes interval. Voila, you got yourself some delicious and healthy snacks. Enjoy! 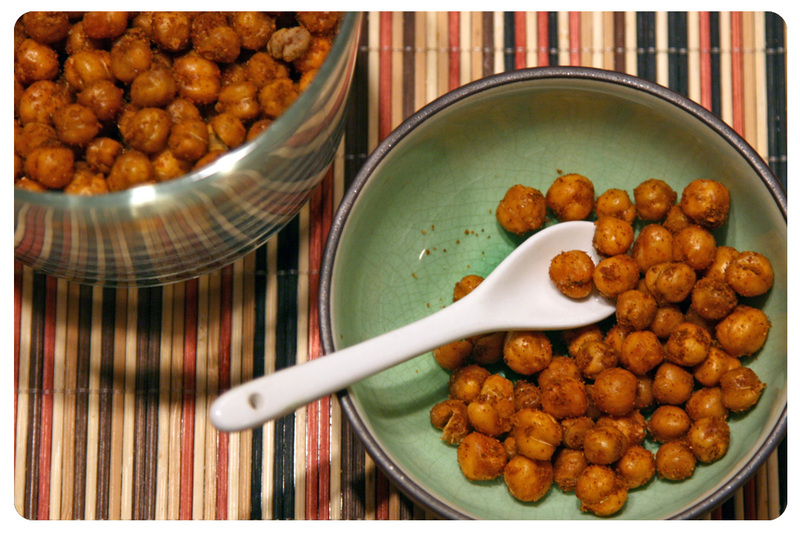 I’ve never had chickpeas by themselves like this, but looks delicious and this is a great nutritious snack! So sorry to hear about your refrigerator situation. Hope it will be fixed soon! Hi Nami! I am surprised at the texture the chickpeas got once roasted, I actually forgot to add salt to the batch I made, but they taste pretty good anyway. I might experiment with other spices the next time, thinking chicken flavoring will be fabulous! What an excellent healthy snack idea! I love chick peas, but do not eat them often enough. I wish I had some now, I would certainly roast them because yours seem to be full of delicious flavours. (We have a Swiss national day so everything is closed). I hope your fridge will be repaired soon, but as I see with these snacks necessity is the mother of invention 😉 There is always a good side when we have limited possibilities in cooking. Hi Sissi! I am surprised at how yummy the chickpeas are, and it’s great little girl likes them also, low cal and high fiber plus high protein, what’s not to like right? We are waiting till next Thursday for the repairman to show up, it’s a week away and I am not too thrilled. Good thing is meanwhile I am clearing out some frozen foods. Like tonight we will be eating some fried dumplings. Just wait until the fridge gets fixed, can’t wait to fill it back up again! I have just popped in because I have completely forgotten to say that your lemongrass experiment worked perfectly! I have planted it and unfortunately I think I experimented too late because it doesn’t grow (but keeps green). I must repeat it next year, in spring. It is so much fun to observe the plants growing roots in a jar filled with water! I really feel sorry for your lack of fridge, but at least you have the freezer working! You can also clean the fridge thoroughly 😉 (I do it so rarely… I have recently heard a doctor saying we should do it every two weeks!!! I don’t do it even every two months…). I am growing green onions in a little tumbler on my kitchen counter, they are sprouting beautifully, and all I needed to do was save the root (white portion) and stick them in tap water. This way I can have fresh green onions anytime, amazing! Hi Ray! I guess all in all, it’s good that my fridge has duo engines, so the freezer is working hard while the fridge needs help. At least all my high dollar items are safe! I really like the chickpeas, will probably try to make some hummus next! It’s good to have handy hubbies! YourTube has been a great place for people to figure things out easily. Though in our case looks like we will just wait for the warranty company until next Thursday, can’t wait to go grocery shop at my favorite market again and fill the fridge up! Hi Jeno 🙂 I’m so sorry that you’ve had fridge issues it’s horrible! I can only imagine the amount of food you had to throw away and how inconvenient it is. Why can’t they be more efficient and send someone over sooner geez! Not good enough! I am so going to make these, Jeno! We love having snacks with a glass of beer before dinner, so this is a definite. We also love a chickpeas and roast butternut salad – but maybe I shouldn’t mention salad if you still don’t have a fridge! Hope it’s fixed soon! Thank you Jenny for the well wish. I suspect my fridge will be back in order in 1 week’s time, so mentally I am at a better place, hahaha! You know I love hearing people wind down at the end of day with a drink, it’s a great way to enjoy life! Very cool! I wanted to make something like this for a while now, and I love the spice combo you used! I’d rather cook the chickpeas myself though because canned legumes always give me tummy troubles. Ahhh, that’s interesting! While looking for the various recipes, I noticed some commenter noting they rather cook their own chickpeas due to cost. I liked this batch a lot though they got moldy because I didn’t eat them fast enough (no preservatives), the next batch I will try different spices and see how they taste!